That was the “free” part. There’s also the part where there’s no one to baby me when I’m sick, comfort me when I’m upset, jump up and down for joy with when good things happen, perform critter removal (dead or alive), or help put up the hurricane shutters, pay the mortgage and install ceiling fans. I’m not complaining about the “alone” part, really. It’s what I chose, the alternatives available to me at the time of the choice having proven unsatisfactory. But – while I really enjoy the “free” part, there are times when the “alone” part can get to me. I’m hoping to illustrate a little bit of both sides of the coin here at The Single Rider. Some of the material posted here was initially published elsewhere. I republished it here because I felt it would help to inform this blog and whatever readers it attracts. And although I started this blog in May 2009, I’ve used the original dates of publication here. EDITED name of page on 05-16-2012, because the spambots apparently know to look for “About” pages! Congrats on the new blog! I admire you for choosing single and not settling for less than you deserve….or desire! I’m proud of you…and on any alone days that get too quiet….you can always call or text me! I don’t know that I want to put my running shoes on – I so love the guy (I think) but am sooooooo scared!!! Hey single rider; ) great handle! I once wrote a song… It was called “I Live Alone” and here’s a bit so you know that I know. We really should have coffee! I’ve got no one hustling bustling in and out of my house, I live alone. Ahhh yes. There are always trade offs. I like the green bead dinner lady above, LOL. Aren’t we a hoot? Write write write – it is fabulous! Congratulations on your new blog. I, too, am a “single rider” being a widow at 52/8years ago. I know exactly how “quiet” alone can be. I also like my independence. No one to answer to, except 3 overly protecting children and their spouses, whom I love very much. I also read your Sanibel blogs…coming down next summer. A little heaven on earth. Hugs! 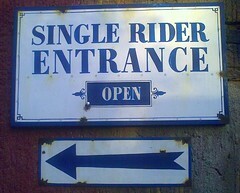 Wow, I didn’t realize so many were/had been a “single rider”. Seems like I stumble upon many, many “mommy blogs” and very few single riders. Happy to know this about you all! Congrats on the new blog. Looking forward to reading it! Keep on writing. You know what I think about what women need men for.Wait-no you don’t……One of these days I’ll give a seminar for women only. Just that one day I would like to have lite colored furniture,and a clean toilet……. I like to travel alone. I am married and love being so but there are times when to do what you want when you want are wonderful. Hi Tink, err Erin. This looks like it will be a nice blog. I am glad you are satisfied, I didn’t say happy, with not being married. I can feel for you some because when I was divorced for three years before I met Mrs. Jim I loved the freedom. We have been married 36 years and are both moderately happy. Even so, I still enjoy being alone and really don’t need anyone’s company. Except perhaps for a dog or two, Adi and Katrin are my buds. Back then I bought a motorcycle and was a ‘single rider’ also. That wasn’t the case a lot though as the girls/women really did like to ride along with me. I still remember quite a few and have some VERY fond memories of those times. I don’t kiss and tell so you will never know. Anyway, I will be checking in on you, perhaps weekly. I am fairly well snowed under and although I keep posted I don’t keep up to the minute with my reading and commenting. I generally comment when I read. I think your new blog might become one of my favorites! Good job, Tink! Congrats on you new blog. Loved reading it. And you know I’m married with 2 kiddies (boys) but there are days… quite a few actually… where I’m certain single is the way to go. Yes, a bit lonely, but wonderfully peaceful. Oh! And if you get lonely, like steinbecke says, feel free to drop me a line. You know I love chatting with you. Wonderful thought-provoking perspectives, Tink! Life is all about balance, isn’t it? There are days when single sounds sooooo inviting! Congrats on your new blog! I’ve been in both situations and each one has advantages and disadvantages. And I’m getting to where I want that someone to just be there for me – I never did before.